Priyadarshini Degree and PG College, Hyderabad has advertised for recruitment of Teaching Faculty- Professor / Associate Professor / Assistant Professor Plus Non-Faculty jobs vacancies. 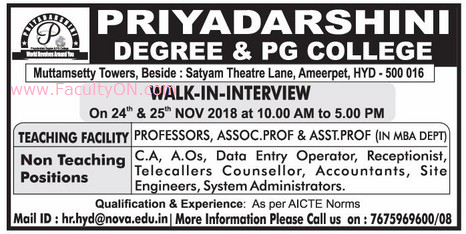 Interested and eligible job aspirants are requested to walk-in on 24th and 25th November 2018. Check out further more details below. About College: NOVA Educational Society established in the year 1998, is a place of minds and mega minds. NES is dedicated to produce smart & intelligent Graduates and Post Graduates, who develop their potential to the fullestis. NES committed to achive and continue unmatched excellence in technical education.